While Pro Tools is best known for its audio creation and editing abilities, it has a feature that most people are unaware of and never use and that is the video engine. While you cannot create or edit video with Pro Tools, you can definitely add it to your session and play it back with any other tracks in the session. What this enables us to do is sync music to picture. This makes Pro Tools one of the leading players in the post production audio market. The last row in the “Settings” section presents us with the option of enabling the video engine. Click “Enable” and then click “OK”. 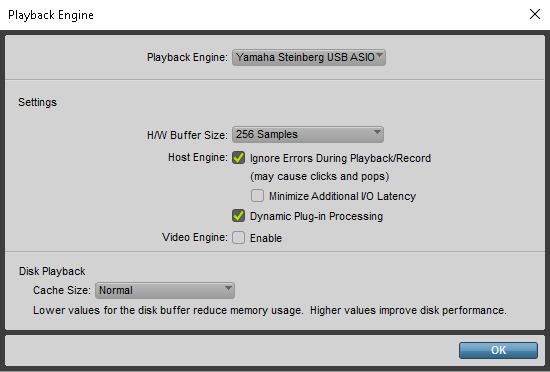 It will take a few seconds for Pro Tools to start the video engine. You can also enable the video engine simply by importing a video to your session; you will be prompted whether you want to enable your video engine or not via a pop-up window. Importing video to your session is pretty straight forward. You can either drag and drop a video in Pro Tools or use the import menu. The only supported video format in Pro Tools is the QuickTime format MOV. Whether you use the import menu or you simply drag and drop the video you will be prompted to choose a location to store the audio track the video is interleaved with. The creation of tracks is identical to any typical session on a music laptop; you can create any type of track in a session that contains video. You may discard the original audio that came with the movie or use it as guidance for what you intend to create. I usually like to steal tempo if a musical piece is involved because that will make the matching process a lot easier. However, sometimes tempo is pretty bad in the original audio or audio is nonexistent so you have to think up your own tempo to match the movement of the picture. For the purpose of this example create a few audio tracks and a few instrument tracks or MIDI tracks and develop a plan of what instruments you will use, where and think up a general structure for the sound. If there are points where you want to sync a certain sound to a certain point in the video there are a few techniques to achieve that. Enter the exact time value you found while using the scrub tool and enter it in the “Start” field. Before, you should use some editing techniques to trim and manage the shape of the audio clip so it matches the picture well. 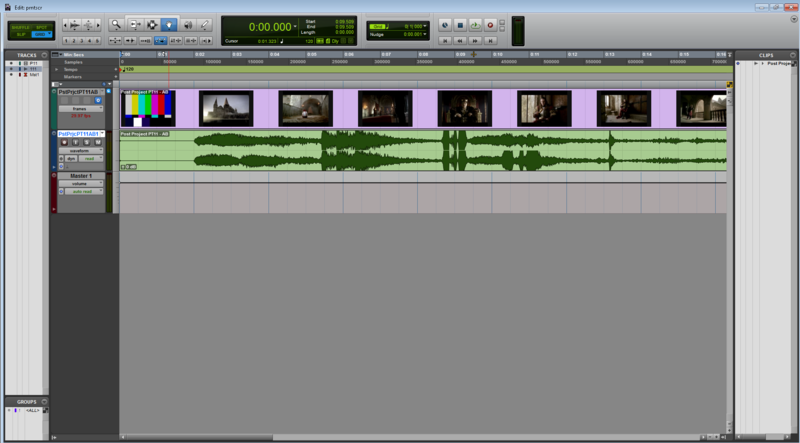 In my example I adjust the tail of the audio clip so it sounded like a short thud, similar to dropping an object. Another option is using sync points. You can read all about how to use and define them here. You created tracks, astonishing music, you synced SFX to picture and now you are ready to export the video with this sonic universe you created. 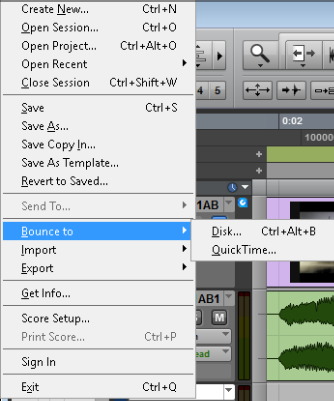 In order to do so you have to use the “Bounce To…” menu, under the “File” tab and choose QuickTime. After you select your desired options click bounce and voila! You’re done. Check the bounced file to see that the export is good and if necessary make adjustments. That concludes the process! Syncing sound to picture is one of the most powerful tools in Pro Tools in my opinion and with the trend of music sales and streaming revenue going down constantly many artists are considering revenue from sources like syncing to commercials, film and games more and more enticing. Why is the sound quality so low and bad when bouncing to QuickTime? Hi Bob! I am not sure what you mean – you get the same bounce options for audio when you bounce to QuickTime as you do with any bounce.